Foldin shelving unit characterizes by its simplicity and modesty, however strong construction is able to sustain the needs of nowadays consumer. This modest wooden knock down shelf, created by design studio etc.etc. can vary in sizes and forms. The design is inspired by Japanese aesthetics and brought to a western type of furniture. 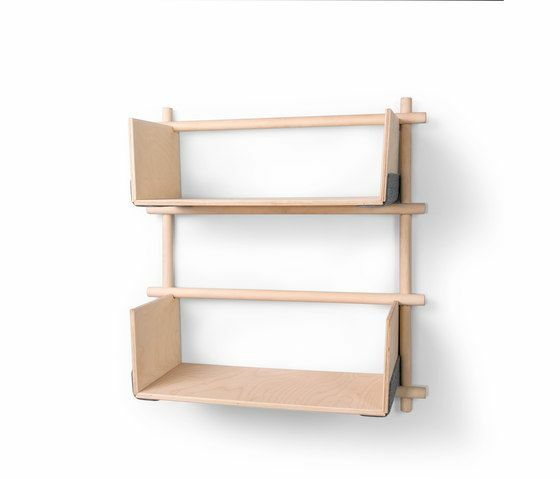 The shelf is comprised out of a framework and foldable shelves. Each shelf is made out of three plywood plates joined with a sheet of felt. This cosy and light piece of furniture suits perfectly in almost every interior and room: customers purchase it into offices, living rooms and for children to storage their beloved books.It is easy to remove or replace the shelves simply by folding the sides of the shelves and storing flat-packed.